If driving on roads with road salt. If driving in coastal areas. If tar, soot, bird droppings, insects, or tree sap are stuck to painted surfaces. 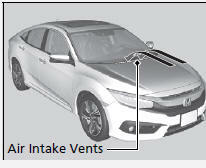 Do not spray water into the air intake vents. It can cause a malfunction. Do not spray water onto the capless unit when the fuel fill door is open. It can cause damage to the fuel system or engine.